Glidden® The Right Paint For Every Project. Make every job as cost-efficient as possible with Glidden Paint and services. Our Glidden Paint Sales Reps at The Home Depot are ready to act as your 360° specialists, offering useful options to streamline the whole process. Glidden® Paint from The Home Depot includes a wide range of contractor paint products that combine ease of use, lasting results and time-saving innovations to rival other top brands, all at a price that won't break your budget. Good news if you're a contractor: Paint jobs can now be easier than ever. With a full portfolio of products complemented by convenient services, Glidden Paint from The Home Depot can save you time, money and effort on any painting job. That's partly because The Home Depot offers all the paint and related supplies you need at a single, nearby source, but there's more to it than that. By working with a Glidden Paint Sales Rep, you also get all the expertise that comes with decades of serving contractors like you. 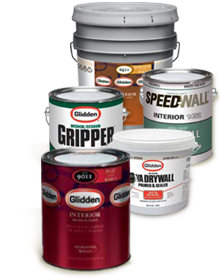 Glidden Paint Sales Reps are dedicated to making your painting jobs easier all around. © 2012 Akzo Nobel Paints LLC, All Rights Reserved.